Our Smoke + Mirrors Cider Tonic is ridiculous. It is just so good. It stokes the fire in the belly and provides fuel for Revolution taking place -- within and without. Warming, stimulating, and deeply nourishing, Smoke + Mirrors is a simple yet effective folk remedy for maintaining vigor and vitality year-round. Made with honey, apple cider vinegar, smokey chipotle peppers, and warming, antioxidant rich herbs, its flavor is deep and earthy, complex yet piquant. 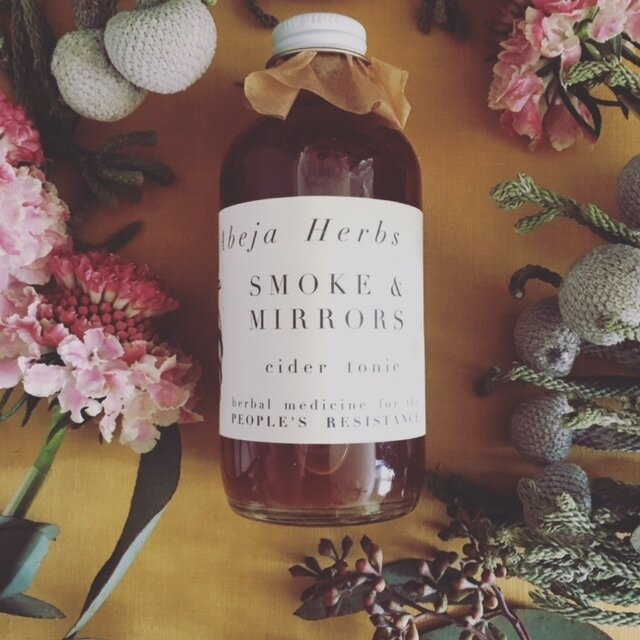 A perfect sipping vinegar, Smoke + Mirrors makes a welcome addition to any wellness regimen. For acute bouts when you feel under the weather, we recommend small frequent sips throughout the day. To encourage digestion and elimination take first thing in the morning upon rising with a bit of hot water. Food-like in nature, this kitchen staple can also be added to salad dressings, tossed with your favorite steamed veggies, or simply enjoy by the teaspoonful. Food is not what it once was. Soil is not what it once was. Because of modern farming practices, the natural cycle of minerals through the soil and into our food has been disrupted. As a result, these depleted soils no longer impart the same mineral content to the foods which are grown in them. What does this mean for us as humans consuming these vegetables, nutritional ghosts of their former selves? Unfortunately, it means that no matter how many leafy greens we eat, organic or not, unless they are being grown in lovingly tended soil with an intact nutrient cycle, we are not getting the mineral nutrition that our body needs and expects from them. Longterm mineral deficiency can lead to impaired cognitive function, depleted adrenals, mental fog, muscle fatigue and cramping, restless legs, anxiety, depression, tinnitus and countless other symptoms increasingly prevalent in the modern world. ​Today, many folks are quick to reach for fast-acting adaptogens or stimulants. When paired with larger shifts in lifestyle and increased attention to self-care these are valuable allies. However, when used on their own or not matched appropriately to one's constitution, these potent herbs will often further injure an already depleted system. Mineral Alchemy is our answer to the widespread deficiencies that we've observed in ourselves, our friends, our clients, and our community. When we nourish the body, giving it the building blocks that it needs to regulate our nervous systems, and optimize pathways of detoxifcation, our system will come back into balance on its own. Certain herbs act as mineral concentrators, seeking out whatever minerals are present in the soil in which they are grown and concentrating them into their tissues. 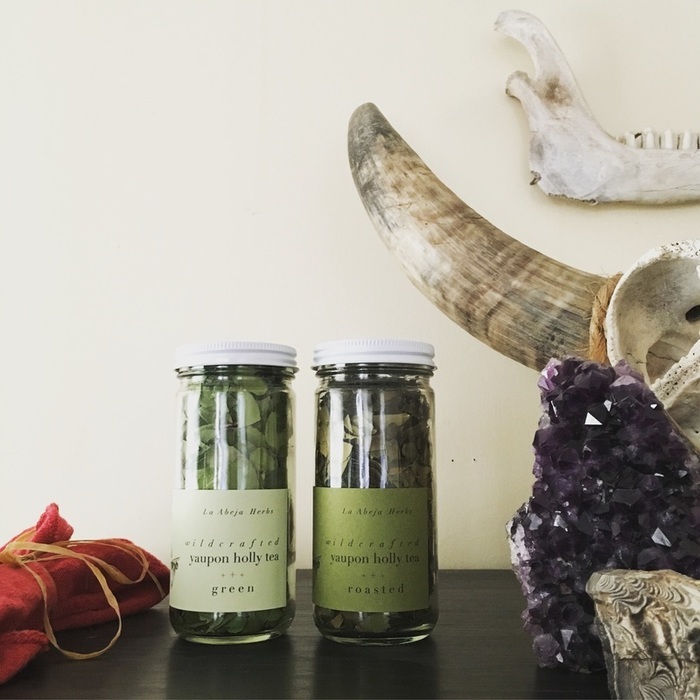 All herbs included in our Mineral Alchemy formula are wildcrafted in pristine environs with rich soil or otherwise grown using biodynamic methods which ensure that the soils are replete with minerals. Taken regularly, this deeply nourishing formula will slowly nourish the body on the deepest level possible, building your health from the inside out in a way that is steady, sustainable, and safe. We recommend enjoying two teaspoonfuls daily, added to a smoothie, stirred into applesauce, or taken in hot water. In addition to working with this formula on a daily basis, we recommend prioritizing a high protein breakfast, enjoying a cup of nourishing bone broth daily, decreasing your intake of sugar and simple carbohydrates, and taking your time to enjoy all of the foods which you nourish yourself with, sitting in stillness for your meals, and giving thanks. ​​Mushrooms are, far and away, some of the most powerful medicines on Earth. They work to heal not only humans and animals, but plants and even entire ecosystems. They are masters of alchemy -- transforming the decaying matter of the forest into new life, brimming with vitality. True tonic medicines, mushrooms are remarkably safe to use, working to balance and nourish many systems of the body simultaneously. The Fungal Kingdom has long been revered by humanity, and for good reason. These lifeforms have the ability to reconnect us to the innate wisdom of both the microcosm of our bodies as well as the macrocosm of the Universe. At this time in our culture there is a renaissance of appreciation for and fascination with mushrooms. Much of this fascination is due to the truly astounding ability they have to heal both specific ailments in our species as well as address the wider ecological challenges we face on Earth. Mushrooms are a medicine for reconnecting us to the wider world of non-human intelligence and helping us to access the profound ability we have to offer healing and prayer to the Earth. Similarly, Cacao is renowned as a Sacred Plant Medicine for restoring balance and homeostasis in times of planetary crisis; for reminding humans that humility is the cornerstone of our humanity. There is no doubt that we find ourselves living in precarious times. This Wildcrafted Medicinal Mushroom Hot Chocolate is a medicine for waking up and slowing down; for seeing the world around us as it truly is -- alive and intelligent, imbued with cosmic resilience and regenerative potential. It is a medicine for helping each of us to find our small role in restoring beauty and wildness to the worlds within and without. This formula is pure medicine and contains no fillers. It is meant to be enjoyed in a ceremonial manner, like a traditional drinking chocolate. We recommend adding one heaping tablespoon to four ounces of water or milk, heating through, and sipping straight or sweetening with honey to taste. 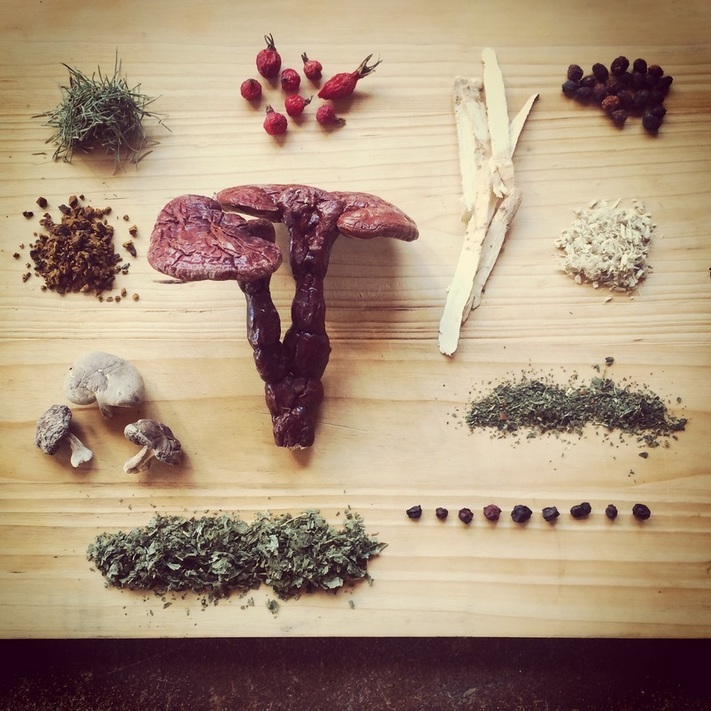 Our Herbal Broth Blend is a careful mix of organic and wildcrafted leaves, roots, berries, and fungi carefully selected to support you in optimal health all season long. Each jar includes detailed and easy to follow recipe! Blurring the lines quite pleasingly between food and medicine, herbal broths are a seasonally-adaptable staple sure to keep you feeling nourished all year round. Sip it on its own, braise your greens with a generous splash, simmer your morning eggs in a small amount, or use it to boost both the flavor and nutritional content of any simple soup. Extremely rich in easily assimilable proteins, gelatin, and minerals this herbal bone broth supports joint health, brings resilience to the immune system, nourishes essential intestinal flora, and does so much more! Enjoyed daily and shared generously, this soul-satisfying broth will truly become one of your favorite foods as well as your best medicine! Learn More About The Benefits Of Herbal Broth! Yaupon Holly, native to Texas, contains naturally occurring caffeine and theobromine -- two of the plant compounds most beloved and sought after by Humans. Yaupon Holly is a close relative of Yerba Mate and can be enjoyed similarly. In fact, we prefer both the flavor and effects of our local and wild Yaupon Holly to those of South American Yerba Mate. Our favorite way to start the day, beginning your morning with a cup of Yaupon promises to leave you focused and invigorated yet unhurried. Available both green + roasted, the Green Yaupon Holly has a flavor profile similar to that of Green Tea but is less tannic and slightly more mellow, while the Roasted Yaupon Holly is earthy and complex, nutty and nuanced. Each jar is filled to the brim with enough Yaupon for eighteen to twenty two individual servings.